Hope you are doing well and it is time for some more fun and interesting details on the development and evolution of the EcoLine or economy made knives. The Victorinox evolution on the 91mm Officier knives says the new shaped small knife blade is from 1973. I would believe it is correct and again I would expect this to be from “from now on” 1973 small blade without clip. The left knife I would believe is from 1973-1975 like I have talked so much about. The dimension or thickness of the main blade and the small blade is slimmer on this knife. There are variations also on Elinox crossbow tang stamped knives. Next is the 1976-1980 knife and this got a thicker main blade and small blade. It is not much but it is there and it is no coincident because this is a deliberate evolution. So let us imagine the 1973-1975 economy made knife with the signal color handle ABS material. This is made to be an economy category knife. This knife is different than other economy made knives at this time. The same tang stamp used at this time in history got a thicker blade very close to the one used from 1976. This mean there are different levels on them and therefor the blade thickness is important to have in mind. It can be used as a tool for dating but not as a 100% guide. The signal colored ABS made knives during 1973-1975 is in many ways the lowest quality I have seen so far. Still it is just a joy to research. 1973-1975 economy made knives are in some senses for me in general a time of changes and the precision is sometimes in question. I have put the 1973-1975 knife to be made in the mid-1970s and it is not possible for me to be more precise. Every knife tells a story! 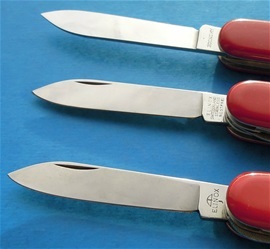 On the picture are economy made knives from 1970-1975. The Elinox crossbow stamped one is the oldest and it got the thickest blade. Next is a 1973-1975 tang stamped one with a bit slimmer blade. On the top is the signal colored one and it got the slimmest blades. 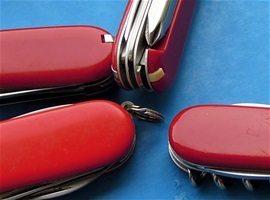 I would believe the evolution of the Swiss Army Knives got different production methods. I do not have the 100% information on this. By looking on the knives I can see a change after 1973. It is important to remember that the signal colored one is a bit special. I can see a change on knives after 1976 and I would believe a change is the production for the economy made knives at this time window. The slim blades on the signal colored one is deliberate and not a coincident. Seen on other knives as well and on a knife never used. Changes in the production can be the use of a slimmer stock steel or the use of dropped forged blades. This is very interesting! Even if a blade is drop forged the dimension and precision must be 100% unless the assembly would not work. I am very interested in learning more about the use of drop forged blades and when the changes did happen to the more modern process. To interpret what blades are drop forged and not is too difficult to see because everyone know the grinding and polishing in the production. The different polishing methods that could influence the appearance as well. Let me know if you have information on the drop forged vs the stamped out process. Or other. I can see obvious production changes 1970-1975 and 1976-1980. I have a feeling that there are mid-1970s changes that are the most important. There are different levels and products in a time window. This means there different sub-categories on economy made knives. Toothpick and tweezers was used and it is not from 1994 this was introduced. Sometimes a knife is called an economy made knife because it is not made with the finest art production. This is so on the more regular lines by Victorinox in history too. It is an economy made knife with the Elinox crossbow or the other stamps I have shown you. Emblems and tang stamps are a very good guide but not all knives got an emblem on. This can be because it got an inlay of some kind instead. It seems to me that in the mid-1970s you still got differences in the production but also changes done for evolution and to become more modern. I have researched much about the history of the new factory buildings and time windows. The toothpick and tweezers are usually not on after 1975. 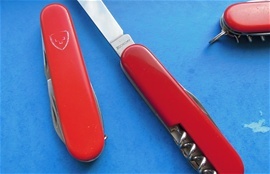 There is also one extra interesting detail on the Victorinox knives that changed in the mid-1970s. The knives after 1976 got the new changes on the function VS the spring. This you can feel when opening the main blade in the half open position. The economy made knives from 1976 got the new changes. I believe it is related to the spring pressure. You can still feel a certain detail on the knives after 1976 but there is a change at this time. The full change is in 1979 and up. i will explain some more what i mean on the spring pressure and the function vs the spring. On the knives with a more slim blade the spring is according. If you open economy made knives from the mid-1970s both slim and more normal blades with springs according to the dimesions you feel a kind of stop or a notch in half open position. 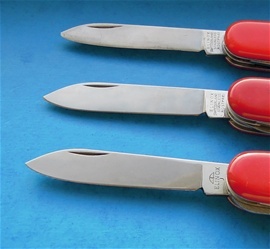 There is a change on the knives around 1976 and a precision and an end to this notch in the half stop position from 1979. It is very easy to feel if you try. There is a difference in spring pressure, precision and total quality. There must have been a change in the production at this time. The feeling in the half open position on the main blade is not designed to be any function, it is regarding the total design for the spring pressure i believe that makes this strange feel when opening the blade. There is also on the tang evidence of a production factor on mid-1970s knives. For sure there is a difference in the behavior on the economy made knives and the regular line. It is easy to feel. The quality on the economy made knives are better from 1979 and up but not as good as the regular lines. 1979 is maybe when the biggest changes for the quality did happen. There is much going on with this line after this year. We know from history the knives made out of regard for the Association too. 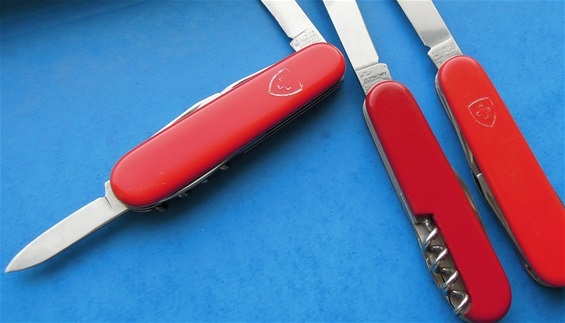 In the mid-1970s Victorinox experimented with different corkscrews for the economy made knives. Some are too slim and fragile. The tint or color is different as well. The economy made knives from 1976 show a new and improved one but still not the best. 1979 is maybe the year here too. I am very happy with the Victorinox quality on modern knives and the main line is the best still. The EcoLine today is pretty close. I have a feeling that the economy made knives is of a big importance towards the modern products. I do not want to speculate. I am however sure that the the less expencive knives gradually devloped from 1976 to 1979 and then 1980 is a milestone with the Officier Suisse tang stamp. In the 1990s it became it and today very close to the regular line. It is of great interest to me anything related to the 1970s era and how this line devloped. It did survive! Somehow it did not start so well from 1957 and it seems it almost collapsed in quality in 1975. It did survive. I took notice on some information from Victorinox that later to our surprise we found that people actually wanted the more expensive knives in the Swiss Souvenir shops. The quality on 1957-1970 economy made knives is fair but the mid-1970s are close to a collapse on some. Some economy knives made 1973-1975 got a fair quality and is just not made with the finest arts production. Some of these are St. Christopher Motorist knives. The economy made knives with this inlay is very collectable and they are valuable. The mid-1970s knives with the signal color and the economy made knives with the weak corkscrew are the lowest quality I have seen and are the knives that I feel is close to the collapse of the line.